Ethiopia is richly blessed and yet one of the poorest countries of the earth. Only 3 percent of all villages have an electricity supply. At least the country is greatly blessed in other areas, such as with a constant breezy wind that rarely becomes a storm. The utilization of the wind power in connection with hydraulic power, organic energy and solar power is considered to be the way forward for the country. Since there are only few power lines, the decentralized "small" energy extraction will be of importance. What has been missing up till now are sufficient experiences in power generation by means of wind turbines. 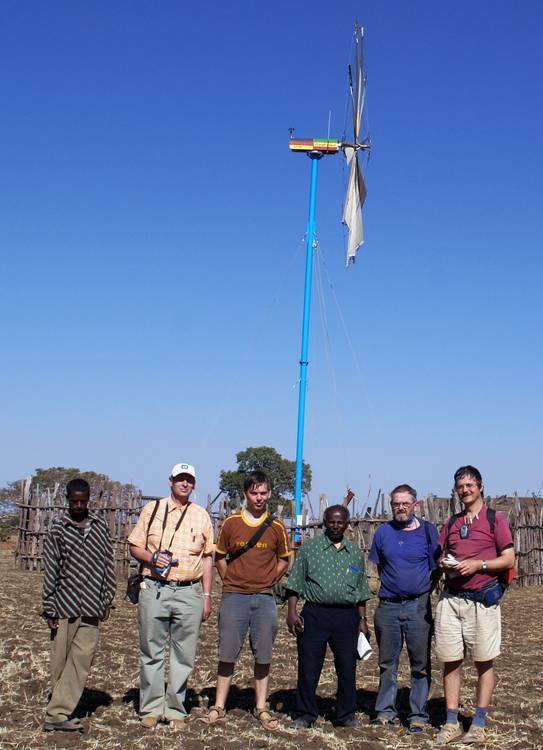 The project "wind energy for Debo “is one of the first projects of its kind in Ethiopia. It is an exciting venture, since until now it has with all good results always rescued itself with a continuous evaluation of experiences and addaptations. This is expressed in all openness in the result reports. The canvas wind turbine installation had survived the year 2007 without damages. It appeared however, that because of the low average wind speed of 2-3m/s, the existing version with mechanism doesn't run optimally. (Despite good present accomplishment values of inert start process and fast braking). The average performance of the installation is too low. In order to cover the energy needs in Debo, a small solar unit was installed on the transformer station in 2008 and was integrated into the existing system. Furthermore a gearless wind wheel version, which had been tested in Rüsseina with very good results, was also installed in 2009 with new designs of transformer-technic. Now, wind and achievement data are measured in Debo weekly in order to determine sound information for the development of the project. The Ethiopian village Debo finally has light! The team CreaProtect, with Dipl Ing. 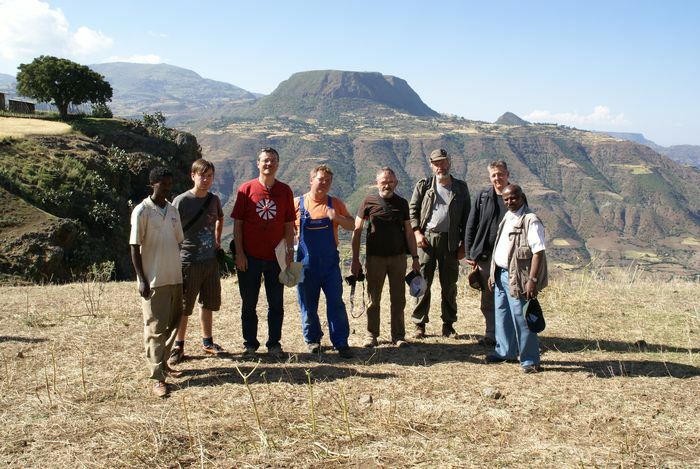 Wolde Giorgis Demissie were on an inspection trip in Ethiopia February 2005, in order to explore the possibilities of a project realization. The project village Debo was visited on that occasion. The village's Elders asked for the urgent supply of electricity to public buildings. In February 2006, the team was back in Debo and made extensive preparations, (sees sub category "result report in 2006“ on this Home-Page.) In 2007 finally the team CreaProtect could put the wind turbine installation, the transformer station and the electro installations in the church, administration offices, school and infirmary into operation! , att. to this the detailed report under the category "result report 2007“. in 2008, a montage trip took place for the maintenance and organizational regulations regarding the lasting utilization and about the system stabilization by means of solar installation, att. to this a detailed report under the category "result report 2008“). In October 2009, the montage group could with collected knowledge from past experiences, modify the wind power installation, which simplified and strengthened the transformer technic and install a water supply to the hospital, (att. to this the detailed "result report 2009“). 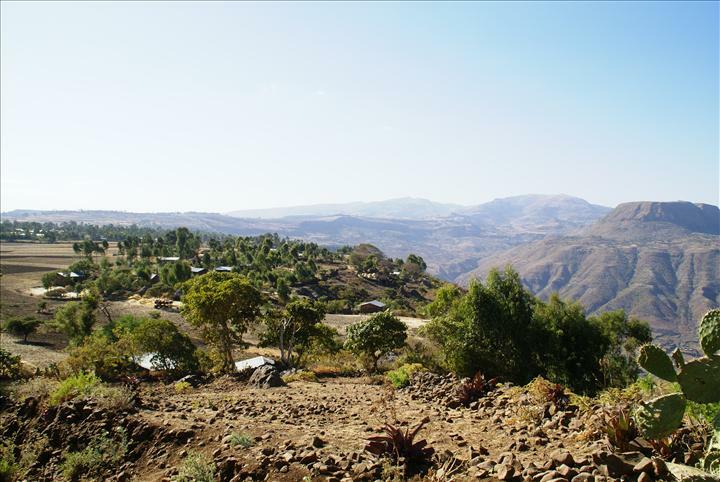 Debo lies approximately 410 km northwest of Addis Abeba (Kebele , east Gojjam zone) at the edge of the Nile valley. It lays approximately 2.650 a.s.l. The population of Debo is approximately 2.000 people. The village is relatively densely populated (it is approximately 800 m long). The people live exclusively from the agriculture. The village lies geographically on the ruptured terrain of the Nile valley. One of Ethiopia's oldest monasteries also lies on the valley slopes. The terrain profile is very even, up until the valley slopes. The main focus of the electrification is in the electric supply to hospital, school, monastery and village administration. In addition, the village illumination in 2007 and 2008 of the market place and the further extension along the village streets. 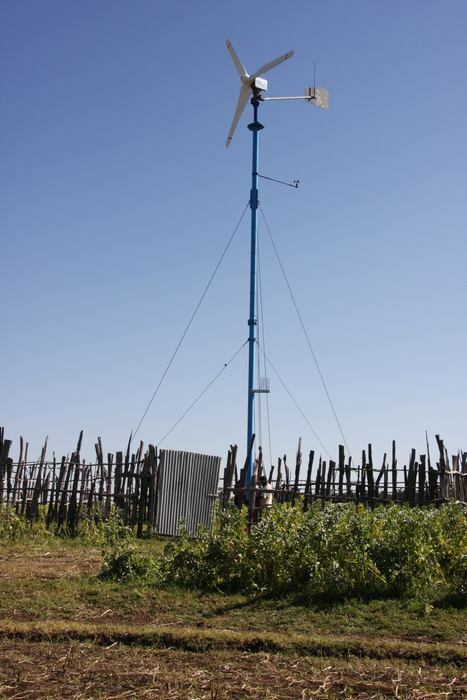 The limitation of public buildings was the original concern of the village Elders and the intention of the Initiative group "wind energy for Debo", since the electrification of private buildings is restricted by the performance of the wind powered turbines and cost of installing cables. Nevertheless due to the expansion of the power supply in 2008 and 2009 power supplies for private buildings are being planned. The Health-Centre in Debo was been considerably re-developed in the last two years through state means. In 2005, it was a small flat construction with one outbuilding. The work and treatment conditions were miserable. In the years 2006 and 2007, two wide flat buildings were added, one solid with planned Electric installation and a clay construction. The treatment possibilities clearly improved themselves. Without electricity however, the Health-Centre had little chance to work its potential. Because of the fast change from day to night, treatment could only take place until 18.00 o'clock. Work rooms were then already very dim. The small laboratory urgently needed electricity. An old Soviet kerosene refrigerator was used for the refrigeration of the few medications. The hospital is the only one in very wide vicinity and according to statement of the nursing personnel is responsible for more than 30.000 people (!). The total complex was provided with electricity in 2007. Since 2009, the water is supplied by means of electro pump. In the school consisting of many flat constructions, approximately 2000 children are taught in several big class areas and outside. There are competent teachers, who are very interested in the wind energy project. The electricity supply to teacher workrooms and individual classrooms opens the possibility to evening courses and moreover, that the topic "Electro Energy" could be considered as part of the syllabus. Teacher workrooms and an assembly room were supplied with electricity and at this point in time are also supplying power for two computers with printer for computer courses. This consists of a traditional round church and individual small outbuildings. It is escorted by a young theologian, who commits very much by pursuing the introduction of electric light in the monastery, he is very open minded to the wind energy project. The church services begin long before sunrise. This consists of the addministration buildings, bank and court. All simple clay buildings. Here, the energy needs are relatively low. Energy is required for light and small office appliances. In the course of the project it was set up at the market and was driven by the qualified technicians under utilization of electricity .The workshop has a central meaning for the refinancing (creation of a finance reverse of the lasting maintenance of the entire installation), (att. details in the "result report 2009“). These were built in 2007 and 2008 for the market and some streets by two technicians under their own initiative. It is switched per hand. It should be developed further. The question of the technical maintenance and the life expectancy of the project. 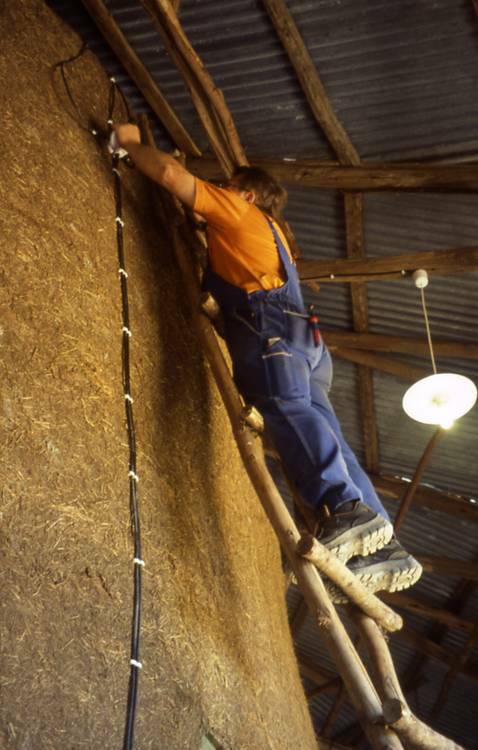 Prerequisite for the project is the training of two maintenance workers, that are resident in the village Debo. This was a necessary component for the project realization. In 2006 through the initiative group, six young people financed by the project, could be trained in Debre Markos in an intensive course for electro technology two of them contracted for the Ethiopian Red Cross. In Debo, two maintenance technicians were selected that now take care of installation and daily maintenance. A simple and clearly illustrated maintenance handbook written by Dr. J. Hahn specifically for the wind power installation ("CreaProtect 3 KILOWATTS “) Which has also been translated into the amharischer language by Dipl. - Ing. W. G. Demissie. This is available to the maintenance technicians in Debo. The concept of the lasting utilization of the entire installation is explained in the result reports for 2009. The total costs of the introduction of CreaProtect in Debo (step 1 electric light): Incl. Travel and transport costs (2005-2009) were 50.000 €. The montage group was for much of the project and the time of the installation honoraria active and covered much of their travel costs privately as well as putting thousands of Euros up front privately. Until now, a bulk of the costs were financed by separate private donations. Thanks to the Diakonische work of the national church Saxony who has though special investment with the Landeskirchlichen credit union Dresden, "solidarity savings letter “come up with 13.000 € Which helps to cover some of the costs incurred in 2006/07. The canvas wind turbine installation had survived the year 2007 without damages. It appeared however, that because of the low average wind speed of 3-6m/s, the existing version with mechanism doesn't run optimally. (Despite good present accomplishment values of inert start process and fast braking). The average performance of the installation is too low. In order to cover the energy needs in Debo, a small solar unit was installed on the Umrichterstation in 2008 and was integrated into the existing system,(att. result report 2008). Furthermore a gearless wind wheel version that had been tested in Rüsseina with very good results was also installed in 2009 with better developed Transformer-Technic ;( att. "Result report 2009“). Now, wind and achievement data are measured in Debo weekly in order to determine sound information for the development of the project. At the end of 2011, a State energy supply was laid in Debo, supplying some houses and some individual local amenities. Our alternative power supply is still being used here as a second network. The district government has decided that the workshop should also become a small educational center for students (stand 10-2012). The Health-Center still uses our energy since the state supply very often cuts out. Therefore, it is important to keep the installation technically revalued. Concrete information in the "Result Report 2012."